An Easy Short Nap Fix. 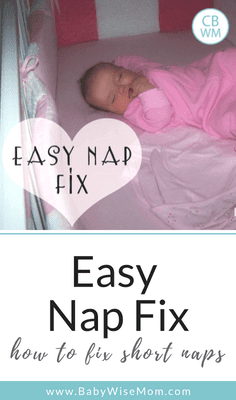 Here is an easy way to get baby taking longer naps and fix those short naps. It seems most if not all moms come across short naps at some point in time. I would like to share my number one fix for both short naps and long crying sessions before naps. The nap/crying fix is nothing new. “During the first two months, if your baby is not napping well, try cutting back on his waketime by 15-minute increments” (On Becoming Babywise, p.130). I wanted to stress this fix. It is not something I really gave much weight while Brayden was a young baby, but learned as he grew how true it was. I do, however, apply it to all ages of babies, on up to my current toddler. If your baby cries a lot before a nap, there is a good chance he was up too long. If your baby typically doesn’t cry at all but cries before a particular nap, he was likely up too long. As your baby gets older, it is easy to let him stay up too long. Many of them change their sleepy cues or drop the cues all together. You also want your baby to get all the waketime possible, often in hopes of a good, long nap will follow. This will often backfire. Maybe you were just having too much fun with baby-and I know we start to miss our babies as the nap draws on. If your baby is waking early, the first thing I would do is evaluate your waketime. Be aware of the time he wakes from the previous nap so you are sure to get him down in time for the next nap. I have found that even at 9 months, Kaitlyn needs to be down in time for a nap. If not, my 2 1/2 hour sleeper turns to a 1 hour sleeper. Sometimes she goes back to sleep, sometimes not. If she is down in time, her nap is seamless. Even with Brayden, getting down for his nap in time is important. His nap starts at 1:00 PM. If he is down by 12:50-1:00, he falls asleep almost immediately. If he is down by 1:15, however, he will take at least an hour to fall asleep. He just stays in his bed and sings to himself. It also isn’t unusual for him to not fall asleep at all after getting down 15 minutes late. So while it is an easy fix, do not discount it. I always recommend it be the first fix tried when problem solving because it is so commonly the culprit and so easy to fix. Some moms are hesitant because they don’t want their baby waking any earlier, but if baby is taking a 45 minute nap and you move downtime back 15 minutes and baby sleeps 1.5-2 hours instead, baby is sleeping much past that old 45 minute mark. Thanks for this easy nap fix. I was wondering what was going on with my DD. After reading this post I can see what is going on with her. We were laying her down late. I work a very early shift and my husband would keep her up so that I could see her before her afternoon nap. I walk in the door at 1pm. Well, she needs to be in bed at 1pm for her nap. So, I told him this week to go ahead and lay her down and not to wait on me (her sleep is more important than me seeing her…if that makes sense). So he started that on Monday and by today she was out before I came in at 1:15pm. PTL! Thanks for all your good info on this blog. I am slowly reading through them all. Ha. So that is why my post are so late! I’m so glad I found this site! We’ve used Babywise with all three of our kids, and have had wonderful results. Right now I am having a problem with my 7-month-old’s naps. A couple of weeks ago she came down with a little cold, which of course disrupted her sleep patterns. Problem is, while she is now sleeping great at night again, she barely naps! She used to take two 1 1/2 to 2 hr naps. Now I put her down for her morning nap and she sleeps about 30 minutes, then won’t go back to sleep. This of course messes up the afternoon, as well. I’ve tried putting her down a little earlier, and keeping her up longer, and letting her cry. Nothing is working. Any advice would be greatly appreciated! See today’s post for my thoughts on waking early. Does she still have the cold? Have you seen the troubleshooting naps post? It also might just be too soon for her to be back on track. I would also consider if she is ready to drop a nap. ok, how do i know when my little one is able to stay awake longer? or at least consistently? she is almost 10 weeks now and has been stuck at 2-2.5 hour feeding schedule – unable to move forward b/c even though she could only stay awake for about 40-45 minutes, after we put her down, she would only sleep for 1-1.5 hours. this doesn’t get us to the 2.5-3 hour mark. though this week she has slept a bit better at nap time and made a 3hour mark once or twice. so maybe she’s moving ahead without my pushing? and maybe she’s able to stay awake longer than i’m allowing? do you have any suggestions? thanks! I am a first time mom of a 3 week old and am wanting to try PDF. You say if baby is crying for long periods of time before napping cut back on wake time. What if cutting back would basically mean going straight from eating to sleeping??? Often times my 3 week old takes 30 minutes to eat and then I only have him up 15 more minutes tops (I’m trying to watch for sleep cues). Only recently have I started seeing some success in getting him awake in between feeding and napping and I don’t want to lose that ground. Is this too early to try getting him to sleep on his own?? I’m also just trying to learn his cry pattern (I don’t even think he knows it himself yet!) but am noticing huge differences before each nap. If you aren’t doing CIO at all on evenings or weekends or you are getting him up while he is crying, I would say that will more than likely make the whole learning process a lot harder on him. Consistency ensures he learns. It will also help him get to a point of no crying (or minimal crying) faster. I would encourage you to push for consistency. It is best for your child in the long run. hello. i am again in need of help with my 3rd son. i am beginning to think he is stubborn or that he may not be a great sleeper like my other two. yikes! he is 12 weeks on wed. and is still having trouble with napping and is still fairly inconsistent at night. most nights he sleeps until about 5:30, and i am still feeding him one last time about 10:00. i think he should be sleeping longer than this by now. as far as his naps, it seems like he sleeps well every other day. i have tried the easy nap fix, but he still seems to sleep, cry, sleep, cry throughout his nap time. perhaps i am giving him too many naps? i currently am keeping him awake about 45 min. total before giving him a nap. so, he is taking 4 naps a day, with the last nap being only 45 min. i am not sure if i have given you enough information to help, but i would appreciate anything you can give me. thanks so much! 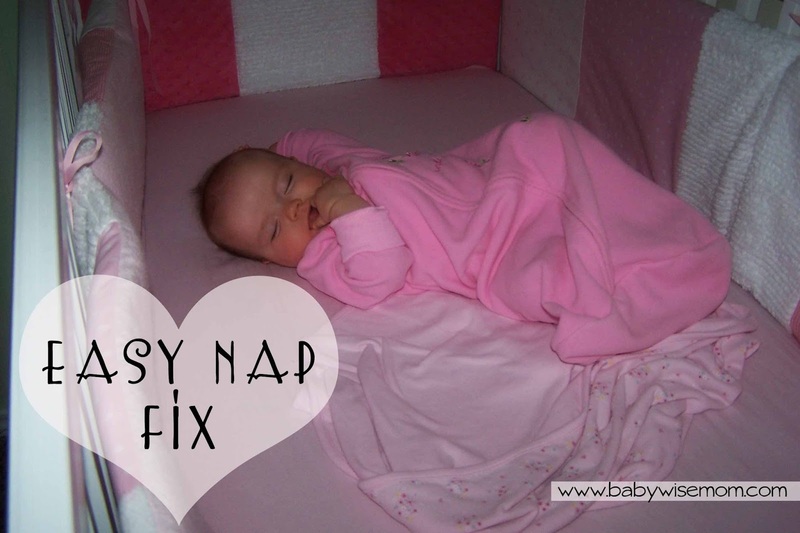 I tried this nap fix when Isabella was 9 months old. Does this still hold true for a 1 year old. Things have just been really strange with her the past few days. Here is her current schedule:7:00 am wake bf,breakfast9:45 nap asleep at 1011:00 wake sippie cup of formula, lunch2:00 nap 4:00/4:30 up sippie6:00/6:30 dinner 7:00 sippie7:30 bedHere is my problem. If I let her sleep past 11 am she will not fall asleep for her pm nap. I thought I would be late getting her home by 2:00 for her nap yesterday so I let her sleep till 11:15 and she did not nap at all. I left her in her crib the whole time. She wasn’t crying or anything, just talking, standing, playing.Now today I woke her at 11:00 and she did the same thing as yesterday. At 3:00 I got her up for about 15 minutes to see if it would help getting her up, then I put her down again. She fell asleep at 3:50 so I allowed her to sleep till 4:30 so it would not interfere with her bed time. Sometimes when I have noticed she is having a problem falling asleep, around 3:00 pm I would give her some formula and it would help her to sleep. What am I doing wrong. Should I start giving her formula at 11:30 and move her lunch to 12 even though she wakes at 11? I really don’t like to have to give her formula to help her to sleep. Should I shorten her am nap to 10:15 and wake at 11:00? I would first make sure it isn’t teething that is waking her. At this point, shortening the waketime isn’t going to fix it because you didn’t change waketime and she was fine before. I would guess she is either transitioning to not not needing the morning nap, or is teething. So I’ve been trying the CIO during the day for naps now for 3 weeks. And this is the stage we are at-and I am not sure where to go from here:His morning nap is pretty good, anywhere from 1 1/2 to 2 hours long. Second and third naps at 1 hour to 1 1/2 hour IF he doesn’t wake up. If my LO who is now 17weeks old-1 month on Sept. 1st wakes up crying then he is not able to get back to sleep.I have kept a very detailed log. I know that he comes out of his sleep around 40-45 mins each nap.Sometimes he will wiggle at this time, sometimes he will open his eyes and talk to himself and then within 10 more minutes go back to sleep.Other times though he goes very quickly from whimpering to crying. It is these naps that he consistently DOES NOT go back to sleep before the next feeding. I have been very diligent in trying to get him down before 60 minutes. (Is 17weeks old and only able to stay up 60 mins including feeding okay? )I can’t seem to figure out why he cries at 40-45mins some naps and not others-I have kept a detailed log and have gone over and over and don’t see any difference in routine. And when he wakes up early from his nap, I have tried feeding him and he only snacks-so should I wait till the 3 hour mark? But then his 60 mins falls right after his eating like this:Here is his schedule today:7:06am Wakes up talking to himself. Feed him7:58 Sleepy so I put him in bed, he wiggles until 8:03 and then falls asleep.8:41 Wakes up, talks to himself, eats his hands9:04 Back asleep10:00am go in to wake him up to feed him. 10:58 back in bed, talking to himself11:03 eyes close asleep11:58 awake and crying and crying12:30 go in to get him because he is still crying.at this point do I try and get him to eat-he normally only snacks cause its not been 3 hours. He isn’t suppose to eat until 1pm. But now he is awake at 11:58-so his 60 mins of awake time ends at 1pm. Do I feed him and try to keep him up longer and then put him down? I keep getting stuck. I have tried to go get him and put him in the swing to fall back to sleep-but that doesn’t help. Once awake and crying, he will only fall asleep if I hold and rock him-which I am not doing any more. Is he too young to be on a 3 hour feeding schedule. Sometimes though, he has gone 3 1/2. At night he has cut down waking to 1 time around 5 am and its the same thing. If he wakes up just talking to himself he will usually go back to sleep until 7 or 7:30am. If he wakes up and starts to cry he will cry until 7am when I go in to get him. And as I said before, when I try to feed him at these times he wakes up crying, he just snacks. I’ve checked for outside factors, air conditioning too hot, too cold and can’t seem to figure it out. Lorri, you are on the right track in your problem solving. Just remain being consistent and paying attention and it should click. At 17 weeks, I am pretty sure Kaitlyn still had only 1 hour wakeitme, maybe 1 hour 15 minutes. Each baby is different so just do what he needs. My son is 4 weeks old and is not napping well at all! After a feeding he has his awake time and then when I see the first sign of tiredness which is usually a yawn followed by some fussiness..I immediatley swaddle him, hold him for a minute until he’s drowsy, nodding in and out, and then I lay him in his bed. One of the following happens..he either stays asleep for 10-20 minutes and then wakes up crying or he wakes up right away and lays there awake looking around for 10-20 minutes and then starts crying..I pick him up and pat him on the back until he’s drowsy again and then I try all over again..same thing happens. Then he gets to a point of screaming crying (I think he becomes overtired) and it starts to take 20-30min just to calm him before even getting him to the point of drowsiness again..This whole cylce of trying to get him down for a nap last about 2 1/2 hours which means its then time for another feeding..so between feedings hes getting maybe a total of 20-30 minutes of sleep. This cant be enough..HELP! kash858, I have the same problem with my 5 week old daughter. She will stay awake for hours. I am SUPER interested to see what the advice is for all of this. I have to go back to work in 3 weeks and would love to be able to work on this issue while home with her. This is such a fascinating “fix” to me because at first glance, it seems so counter intuitive: stay up longer and the baby sleeps less? But you are absolutely right! Kash and Emmas mom, I am sorry I am late on this. I didn’t see your questions until now. Are either of you still having problems? I know atara, it is totally not what any parent would think to do, but it does work! Does anyone have a recommendation if a baby ends up missing an entire nap, b/c he/she cries or doesn’t fall asleep? She cried at first, and then started/stopped multiple times… we are just starting the babywise process, so we know it won’t happen overnight. It is then time to feed her, but she missed that whole nap. Do we change her routine and put her right back down after feeding her or do we keep her up until the next routine naptime? PMac, I answered this where you asked it on the CIO Bootcamp post, just so you know. Hi. I’m still having problems with day time naps. I dropped the 3rd nap and she slept 12 hours for the first time at night. In the morning she can stay up for 1hour to 1.5 hours when she rubs her eyes(nap cue) Then I put her in bed then she falls asleep immediately only to wake 30 – 45 minutes later.I am lucky when she makes it for an hour. I just leave her in her bed she just plays and talks to herself and sometimes she will fall asleep again by herself for 45min or maybe an hour. If she is still awake when there is only an hour left until the next feeding I will go and rock her asleep just to finish out the nap and not be fussy for the next feeding and wake time. The other problem I have is because she is on a 4 hour routine(6 months) If she goes to sleep at 08:00am the next feeding is at 11:am that is a 3 hour gap and she never sleeps that long. ( She is more like Brayden – She is not really a napper) Then in the afternoons she used to take a 2-3hour nap. But now only take 1 hour naps. Her wake time in the afternoon is 1.55 hours before she rubs her eyes and that is my cue to put her down for nap – again she falls asleep immediately, only to take an 1 hour nap.Her afternoon feeding is 15:00 and then again at 18:30 to have her in bed by 18:45 – 19:00. Then she would sleep until the morning 07:00amDo you have any advise for me please??? ?Last week she had tonsillitis but the nap problem started before that. C-lee,I think there is a good chance that rubbing her eyes is not the nap cue, but the “too late” cue. When they fall asleep quickly, but wake up early, it is a sign that the waketime was too long (as outlined in this post). Try shortening her waketime by about 5 minutes at a time to see if there is a better length. Many babies lose nap cues and you have to just watch the clock.If she won’t sleep until the next nap, I really wouldn’t do a four hour routine. You can wait up to 30 minutes after waking to feed, but if she is waking a possible two hours before a feed…I would just go back to three hour intervals. C-lee,I am glad the site has helped you :)I think it wouldn’t hurt to try a three hour routine, but you know her best so you be the judge of that.Also, the paci might be the actual reason for the bad naps. Think that through, and if you think it is, I would get rid of it now because that would fix the bad naps. You might want to check out the blog label “pacifiers.” Good luck! And also she just turned 7 months yesterday – 15 March? How long do you think it will take for her to not need her paci? is one hour considered as a short nap? or is that a okay length? C-lee,With three hours and three naps, you have an interval with no nap between feedings. This is in the evening. So:7 AM–eat (solids too)…nap 10 AM–eat…nap1 PM–eat (solids too)…nap3 PM–eat…6 PM–eat…bedYour final solids could be either at 3 or 6 PM, whichever you prefer.I don’t know how long it will take to break the paci; I haven’t ever used one. See the blog label “pacifiers” for a link to a great article on growingkids about pacifiers. I am sure the length is a large range based on the child.At 7 months, one hour is a short nap. You would be shooting for 1.5-2 hours (some nap for 2.5). I posted a comment/question yesterday, but have more today… Today is our first full day utilizing the BW schedule and my 5 month old never went to sleep for the first nap, was super tired for the 2nd but slept 30 mins and heading into the 3rd nap, should I just feed him and put him down to nap? Can’t utilize CIO, he has reflux. He’s also had a lot of gas today and has been given tummy drops. Hi. We are doing great thank you so much for your help. In the mornins she sleeps between 1 hour 10 min ad 1 hour 20min. In the afternoon she sleeps between 1hour an half to 2 hours.The third nap is 45min nothing I do can make the 3rd nap longer, but I’m okay with that.So I do a combo of 3 hours and 3.1/2 hours.Something is happening though, that I can’t explain. The night before yesterday she woke up at 4am and usaully she goes back to sleep if she wakes. But she did not and when I checked on her she was wide awake. When I leave the room she cries. I did not have to pick her up I just had to sit there. I sat with her for 10 min and she went back to sleep.Last night 20:30pm she woke and also if I leave the room she cries very loudly. we did CIO but she did not stop crying. 21:45 I finally got her to see if its not hunger, but it wasn’t so I just held her and she went to sleep emmediately. She slept until 07:00am after that. This morning she seemed happy and chirpy as always.When I put her down for her morning nap she took a while to settle and then started crying again, again when I enter the room she is quiet when I leave she sceams. Eventually I had to hold her and she slept. I don’t have to rock her just hold her. This is odd because she has never done this before.Even last night I gave her to my husband just to hold while I make a bottle and she cried while with him but if I take her she is happy. And that is odd because she just loves her dad.I’m not doing anything different than usual. She has indpendant playtime 2 times a day for 30min.Do you have any ideas, why she is acting this way?She doesn’t have teeth yet and it doesn’t look like she is teething. I did try giving her painkiller for teething but no defference in her behaviour. (7 and 1/2 months)You don’t have answer my previous question on when I wouldknow when she is ready for a 4 hour schedule I ead your blog on “4 hour schedule”. Thank you. No need to answer my question I think IT was just a phase. Now she is practising standing and sitting in the crib, when actually she should sleep 🙂 – they do know how to keep you young. good luck with the the new baby hope she brings you all joy. Sharyn,He is most likely up too long. When they have a hard time falling asleep, it is usually because of being awake too long. You might try getting him drowsy before putting him in bed. Did you mean changing feedings to 9 PM and 11 PM? That would be fine and would be similar to cluster feeding. I just want to give a word of encouragement to other families having problems with naps. Our son is 8 months old and has been having trouble napping for about a month. He has been waking 30-45 minutes into his nap, then playing for a while, then eventually crying. He will sometimes go back to sleep, sometimes not. With him waking early he then has trouble making it through the next wake time without being a grouch. When he is tired and cranky I get that way too! I have been so frustrated. Just the other day I read this quick-fix article. I was afraid that putting him down earlier would make him wake up earlier, but I was willing to try anything at this point. I did try it, and IT WORKED! It has only been a couple of days now, but from the first nap I tried it we had success. He is still waking in the middle of his nap and talking/playing, maybe even for 30 minutes, but no more crying so far. Also he has gone back to sleep for a total nap time of 2 1/4- 2 1/2 hours (with a window of wake in the middle). He has been waking up happy and has not required an evening nap time. Thank you Plowmanators for the advice you provide on this site. What a help you are to others! Glad to hear it JAWS! Thanks for sharing your success! I've been using your site as a very helpful reference, but now, oh, boy, am I confused! My 11-week old daughter has been doing wonderfully on a 3-hour schedule. It looks like this:7:00 or 7:30 wake/eat8:15 or 8:30 nap10:00 wake/eat11:15 nap1:00 wake/eat2:15 nap4:00 wake/eat5:15 nap6:30 wake/eat8:00 offer a bottle, but doesn't usually eat more than 2 oz.8:30 bedtimeShe has been sleeping through the night for a couple of weeks now. And, the important thing here, she RARELY cries. Since things have been going so well, I thought I'd give in and try a different routine — people had been asking me, "Why do you wake her up?!" So, on Tuesday (today is Thursday), I let her sleep as long as she wanted for her first nap at 8:30. She slept until 11:30. I then kept her up for about 1.5 hours. And she cried. She had a horrible time trying to get back to sleep. I was beside myself because that just never happens with her! And it only got worse. She only slept for 45 minutes, and then would not (could not?) go back to sleep. She continued like that for the rest of the day! And going to bed that night was awful. Lots of crying. My husband and I felt horrible!I vowed never to do that again! Wednesday, we went back to our regular schedule posted above and she did fine (so I don't question that she's sick or that something is bothering her). But, I wake her up from every single nap, so I felt it was time for her to start on a 3.5-hour schedule. Today, I woke her at 7:00, put her down at 8:15, and let her sleep until 10:30 when I woke her and fed her. She cried again and took another 45-minute nap after that! I fed her at 1:00, thinking we'd get back on track, but she had difficulty with the 2:15 nap again. (I started it a bit early since she had napped so briefly prior to that.) She didn't fall asleep until 2:50. Again, I feel awful! Are we doomed to stay on a 3-hour schedule? Have I now trained her to only fall asleep at those times? I can't believe that an extra 30 minutes of sleep has thrown her for such a loop. I didn't question it when it was a 3-hour nap, but this seems bizarre! Did I keep her up too long in between naps? She's now sleeping 10-10.5 hours/night. Can she really need three 2-hour naps during the day plus a fourth of more than an hour? That seems like more sleep than most babies are getting at this stage, doesn't it?She just woke up after 45 minutes and is wailing again. I feel like I will never be able to stray from a 3-hour schedule! Hello – thank you for such a wonderful site – I use it all the time and its been so helpful! I have a 7 week old baby and we have been following Babywise since day 1. My little girl has been sleeping pretty well day and night up until the last week. Since last Saturday, she has taken to lying in her crib awake for most of her naptime – some naps, she doesn't sleep at all. She doesn't cry much (if at all) she just lies there cooing and staring at the white walls/side of crib and sucking her fist. We are swaddling her however, since she has found comfort in sucking her hand we are swaddling her with one arm out to let her do this. The room is quite light – lighter in the mornings (the naps when she tends to not sleep)but in the afternoon its not dark either and often she doesn't sleep those either. She does tend to fuss after the 4pm feed (which is not unusual). Often she won't go down at all for that nap. Once she has been fed at 7pm (or earlier depending on how things go) we follow her bedtime routine and she goes down for the night. At night, I dream feed her at 10 and she sleeps through til about 3.30 then is fed again and sleeps through til 7. I am worried that she is now only sleeping at night out of exhaustion.She takes about 45 mins to feed then we keep her up for about another 20 minutes after that – we have gradually been extending her waketime. She has what we thought were obvious sleep cues (ie: yawning, pulling at her face, jerky movements, clenched fists etc) and when we act on those at night, she goes down without too much fuss, however this past week, during the day – she's just not sleeping. Do you have any suggestions as to how we can solve this problem – thank you. Tracie, she is very, very young. I would not worry about this. BW says to not force an extended schedule. I move Brayden to four hours at 6 months, Kaitlyn at almost 7, and McKenna at barely 5. There is no need to rush and no need to worry.One thing is that if nap lengths differ, she might need different waketime lengths. But she might need the same.My girls both slept a lot more than normal for their ages. Don't worry about it. Just be happy about it 🙂 This is so long as she is happy and engaging during waketime. If she is lethargic and zoned out during waketime, there might be something wrong. Another thought, she is at an age where McKenna basically needed to relearn how to fall asleep on her own. She might just be doing that. My 3 month old fights sleep during the day. He hates napping in his crib. I got in the habit of rocking him to sleep and then transferring him to is crib totally asleep. He has always been a great night sleeper however we would have to lay him down to sleep "asleep" at night as well. However, for the last week we have done nighttime sleep training and now I can lay him down awake at night and he will go to sleep and sleep through the night. 7:30 pm to 6:30am. We did the CIO with check ins every now and then if the crying got hysterical.Now, I have been working on the naps for the last week and it is NOT working at all! I am at my wits end. I was doing the leave and check method but that just made him more mad…..so for the past 3 days I have been doing the following…..For the morning nap I only give him an hour of awake time and really watch for sleepy cues. At the first yawn I take him in his room draw the curtains, change the diaper (in a dim room) and I rock him quietly for a few minutes. During this process he yawns and I see his eyes get very drowsy. I then say okay…it's night night and I put him in the crib. He gets upset and I leave the room. The first nap usually goes one of two ways……he either fusses for an hour at which point I go in and get him and consider it a failed nap or he fusses for like 20 minutes and falls asleep. If he falls asleep sometimes he can sleep the entire two hours OR sometimes he will only sleep for 45 minutes and not make it through the sleep transition that takes place at the 45 minute mark. When he wakes up at the 45 min mark I have tried the CIO technique and I've tried to soothe him back to sleep….either way he does NOT go back to sleep. It's like he has had a power nap and is good to go. If he does get some form of a nap in the a.m. that usually means he will cry the duration of the next two naps. I know he is tired b/c if I were to let him he would easily fall asleep in his swing. He just can't stand to nap in his crib for some reason. When will I be able to lay him down awake and him actually fall asleep on his own? At 3 months how many naps should he be taking and how long should they be. ***He sleeps about 11 hours at night. Also, do I wake him to eat at the exact three hour time to eat or should I let him sleep until he wakes? I have read different opinions on the subject. Some say to always wake to eat others say never wake a sleeping baby except for the first morning wake up which we do typically around 6:30ish.Also, how do I try to extend his waketimes….I see him yawning at the one hour mark almost every time in the a.m. but he can go a little longer in the afternoon. When he does wake at the 45 minute mark do I go in and get him and consider that a nap or do I try to soothe him back to sleep or do I let him CIO until the nap is supposed to be over. If I do get him up then do I feed him right then or do I wait until the 3 hour mark…..when it's time to eat? If I do that latter then it is usually time to lay him down for the next nap right when I finish feeding him. AHHHH! SOrry for the long email I am seriously about to drive myself crazy worrying about naps naps naps! It's all I can think about. Please help me! meclemson, it is hard to say how old he will be before he falls asleep on his own. Be sure to read through the CIO blog label posts. If we knew the day things would get better, I think it would be a lot easier to go through it :)Most three month olds take 4 naps during the day. Some can be down to 3. Most go to 3 around 4 months.I always wake my babies when it is time to eat.See the blog label "waketime". I have a post called "waketime: adding, extending, calculating" or something like that. The short answer is that you don't add waketime, you wait for him to be ready. See also the label "optimal waketime"See the post "naps: troubleshooting revised and updated" published in January of this year. It will tell you what to do when baby wakes early. Basically, you want to make sure baby isn't hungry. If so, you feed. If baby isn't hungry, I would try to get him to sleep some more (see waking early from naps/won't fall asleep for naps). My baby is 14 weeks old and I have been on a 3-3.5 hour schedule. Around 11 weeks my son started sleeping through the night. He would sleep from 11:30 to 7:30. But on week 12 through now he wakes up crying around 5:30, he eventually goes back to sleep about 15 minutes later. I thought it would be just a phase but this has gone on for two weeks. What should I do?Also I have been following the baby wise schedule, eat wake sleep. Since he eats 6 times a day, he takes 5 naps, I know I need to drop a nap but which one?Here is my daily routine:7:30 eat/wake/nap11:00 eat/wake/nap2:00 eat/wake/nap5:00 eat/wake/nap8:00 eat/wake/nap11:00 eat/wake/sleepI've tried eliminating his 11:00pm feeding but he wakes up around 3am if I do. What do you recommend? Farah, it is normal to wake around that time around that age. They jus grow out of it and it takes time.So far as the 11 PM feeding, see label "dreamfeed" for lots on that. I am having a world of troubles trying to get my 6-1/2 week old son on a Schedule. I have two older kids and it worked like a charm. This one, however is a new story. First of all, he has acid reflux. His crib is elevated, etc. but for some reason he will not take a nap in it AT ALL. He grunts, then cries, then full on screams- and it doesn't stop until he is rocked and held- for the entire nap. Finally, it's time to eat again, and he falls asleep while eating because he is so tired. It's so frustrating and tiring because I am a routine person and have two other young kids to take care of. He sometimes will nap in the swing- is it ok to just do what I need to do to survive? Sometimes I feel like giving up, although I Know firsthand the benefits of being on a good feeding/awake/naptime routine. Any suggestions? Kerri, if it were me right now, I would try out the nap for 15 minutes or so and see if he will sleep on his own. If not, move him to the swing to sleep.At his age, and in his situation, it is better to get the sleep when he should. Learning to sleep in his crib can come later. I need help! I have a 7 week old who is a very sweet baby. We have him on a 3 hour feeding schedule. However, HE WILL NOT NAP! He sleeps wonderful at night – from his 10:30 feeding until 6 am with no problem. However, he will not nap. I have cut down wake time to almost nothing, I have pushed back wake time until I feel like I can't push it back anymore, I have gone the in between route. I have tried what others said optimal waketime was for their 7 week old. When I lay him down, he typically will go to sleep on his own with little to no crying. However, he almost ALWAYS wakes up 20,30, or 45 minutes into his nap. We went on a trip to see my parents who live 8 hours away and he slept almost the ENTIRE way except when I was feeding him and then still slept good that night – WHAT IS UP WITH THAT? The other issue is, he WILL NOT go to sleep before 10:30 at night. After his 8:00 feeding, he will scream bloody murder when I put him in his bed – he NEVER does this any other time. He won't go to sleep in his swing or bouncy seat, even if we cuddle him, he might eventually fall asleep for a few minutes in our arms but then wake up again. However, almost as soon as I feed him at 10:30, he is out until 6:00 the next morning. I want to have a happy, healthy baby. However, I can tell he is tired, I watch for his sleep cues and try to put him down after optimal wake time, I am trying everything I can to get him to nap but it is not working. I am going crazy here and do not know what to do next! Please help! There are a few possibilities.For the evening crying, see the label "witching hour"I have to wonder if he might have reflux or something. Since he slept so well propped up in a carseat in the car, and he falls asleep but doesn't stay asleep at home, that would be something I would look into. If so, see the "reflux" blog label. Thanks so much for this site, it has really helped me a lot with my first born, Colin. Colin is now 4 months old and is going down easily for naps & sleeping about 9 hours in a row at night, getting up to eat once, and then sleeping another 3. Our nighttime sleep has never been an issue. Our daytime sleep however has never been great. He is falling asleep easily for his naps now but never sleeps longer than 1 hour. It is almost to the minute. I have tried feeding him, leaving him, CIO, everything and it just seems like he never can sleep longer than that unless we are in the car. My question is that I am finding it impossible to move past a 2.5 hour schedule. His waketime is between 1 hour and 1.25 hours but considering he only sleeps for 1 hour at a time, I feel like I can never extend our routine. Any thoughts?Thanks so much! Lee, Have you read the "naps: troubleshooting revised and updated" post? That would have my general thoughts on the issue.But also see the label "4 month sleep issues" as well as "wonder weeks. "I am glad you like the site! Hi Val,I came across your blog with my first baby and have referred to it many, many times since then, as well as recommended it to all my new mommy friends! I have a 21mo son and a 6 week old (tomorrow) daughter. With my son I did a combo of Babywise and Baby Whisperer. He definitely had to be sleep trained, but was easy and responded to it very well. My daughter has not been as easy!I'm having trouble with naps and hoped you could help. She sleeps great at night – goes down, wakes once to feed, then goes right back to sleep. Naps are another story – she will not fall asleep out of my arms. Even if she falls into a deep sleep (where she's so deep she's twitching!) I will lay her down, swaddled, in her bassinet and about 5 minutes later she'll be wide awake. I've also tried to put her down when she's only a little asleep and the same happens. I've resorted to carrying her in a moby wrap during the day – something I swore I would never do! I know that gas is not an issue – it was in the first couple weeks, but not anymore.I have tried shush pat, but she just lay there with her eyes wide open for 20 minutes. This method is a bit tricky for me to commit to since I have my son to look after at the same time. I also tried CIO for three naps a few days ago and she ended up laying in her bed for about 1 hour, alternating between crying and just being awake. I ended up getting her out when there was an hour left before the next feed, cause I needed her to get some sleep before she ate. I know that CIO needs more than a few tries to work, but I don't feel completely comfortable doing it at only 5/6 weeks. The baby swing doesn't even put this kid to sleep!I wanted to hear your opinion. Half the people I talk to and books I read say that the things you do now set a pattern, and she'll be dependent on me to nap if I keep this up. The other half say that she's still in the newborn transistion phase and will grow out of this and eventually be able to sleep on her own. What do you think? Any tips or tricks I should know about? Thanks! I'm seeing a trend here with all the young babies who don't want to nap! Makes me feel a little better. My 6 week old is on a 3 hour schedule, is a great night sleeper, doesn't cry at all for her bedtime (even though she goes down awake) and usually doesn't cry at all or just very little fussing for her morning nap. The rest of the naps for the day are terrible. She can only do about 40 min of waketime (I've tried to stretch it to 45-50 and that didn't go well) and I'm staying at 40 min waketime all day, for every nap, so I know that's not the issue. She typically sleeps 2 or 2.5 hours for her morning nap, the next nap she will cry all the way through, then the next nap she is usually so tired she will sleep some, then the next nap she will cry all the way through again. In the evenings she sleeps in her bouncy seat with a paci or stays awake in her bouncy seat or swing because of witching hour. I don't know what to do about the naps. I feel like she isn't getting enough day time sleep. I have also learned the hard way that I cannot interfere during her naps. If I go and help her she will scream for every nap for the rest of the day. Also, she has reflux and is on zantac, but I don't think that has anything to do with it because she's sleeping great at night and for her morning nap. Is this something I just have to wait out and hope she becomes more consistent? Also, she sleeps in a bassinet that is elevated, and I really want to move her to the crib. Any advice on that would be great too. Sara,I lean more on the side of "you are setting a pattern now that will continue in the future." However, I think you can also say "I know I am starting a habit right now that I will want to break at XYZ months old. I know it will be hard then and I am okay with that. "In other words, if you are more comfortable holding her to sleep than doing CIO right now, do what you think is best. I do think it would be harder in the future than now, but there are obviously people who disagree with that. Be sure to read over my newborn sleep hierarchy post to help get an idea of what to shoot for when.I would also think carefully about what conditions are like and night and try to recreate those for naps in the day if possible. Janna, I would say you need to get each optimal waketime length down. McKenna was a baby who had different waketimes for every waketime. If you look at her newborn summaries, you will see what they were. So, her first might have been 40 minutes, then the next was 50, the next 55..etc.For the crib move, you might consider a SnuggleU. It helps keep baby in place when elevated. (http://snuggleu.blogspot.com/)I would pick the second or third nap to start–not the first since it is going well. Do that for a few days (or a week). Then add another nap if things are going well. Good luck! Thank you SO much for creating this blog. I read BW this past week and have started trying to put my 1 month old on a schedule by trying the routine. I was having difficulties because for the first couple weeks of his existence he slept solely on/with me. That's made transitioning him to his playpen in our room a challenge. Once I started implementing the routine, I was trying to keep him awake for about 15 minutes after feeding and then putting him in the playpen for a nap. I was letting him CIO, but I found he wouldn't tire himself out or cry himself to sleep. He just cried for over an hour and by then, it was time to feed him again. I found your posts very helpful, because I found I was keeping him awake too long. He eats for roughly 45min to an hour so by the time he was done eating, he's ready to nap. I tried it today, as well as the 4 S's (and I only had to use the first 3) and he wimpered for a little, but went off to sleep. : D I feel a newfound optimism in motherhood, as well as the ability to get other things done around the house instead of waiting on baby hand and foot or being stressed because he's crying. Thank you so much! William's Mom,So glad to have helped! Thanks for sharing that! It makes it all worth it. I just found your blog two days ago and have been reading it at almost every nap time! It has been so helpful to read everyone's comments and your's! I have just a one week old and she has really been doing great with the 3 hours schedule except nap time is starting to get worse. I know her cues and will put her to bed (usually right after her feeding and diaper change, total about 30-45 minutes depending on how long she feeds). She will be very sleepy and start closing her eyes and even close them. Then a few minutes later she wakes herself up. This will go on and off for another half hour or more until she works herself into a real cry or finally nods off. Throughout the day it will become more difficult. I am afraid this is messing up her awake time since she is starting average about an hour and 15 minutes even though I put her down earlier. Once she does fall asleep she sleeps…seems like she could sleep for hours and it's hard to wake her up. But once she is awake she just will not go down. Does this seem normal? I know she is only a week, so I am not sure how much I should just wait it out or change what we are doing.Thank you again! Hey all! I'm not sure if i'm posting this correctly, so please forgive me! I need HELP! I am a young, "single" mother to 16 week twin boys. We typically run a four hour schedule, eating at 7,11,3,7. However, Baby A doesn't like to stay asleep…ever. I've tried to adjust noise-ranging from silent to background noise…no change. I've also tried dark vs. light rooms…no change either. :[ We eat the bedtime bottle at 7, yet will not go to sleep until about 830 and I have to rock them otherwise they SCREAM until they puke. Even sometimes baby A will stay up until 10. What am I doing wrong?! Also, despite what time they go to sleep (finally), they seem to sleep no later than 5am. Baby A willl start to wiggle and make noise which also wakes up baby b-who i think could sleep alot longer if a wasnt constantly waking him up! Can anyone please help? Their daddy is deployed and I just dont have two seconds to even shower sometimes, much less read. :[ If one is asleep, the other is awake! IT NEVER ENDS :[ -sincerely, losing her mind. Wendy Min,Do you swaddle her? If so, you might need to put her down even earlier. tiffaniemichelle,At her age, she should be up for two hours, take her morning nap, up for two hours, down for afternoon nap, up usually until bedtime. Some will have a short catnap. When babies play in their crib, it is usually just with themselves. Some might have a lovie or stuffed animal.Have her up for two, down for two. You will likely have some rough days to get her to sleep in crib instead of in bed with you. Be consistent and youwill get there. I have a 12 week old son who can put himself to sleep, but wakes up every time after 45 minutes. He wakes up tired, so I end up carrying him in my arms to give him the rest he needs. Any suggestions? Elizabeth, I have several posts that can help with this. See "Naps: Troubleshooting Revised and Updated" for a list that can help. Good luck! I have read every single one of your posts on sleep/naps and nothing seems to help my situation. I have a 14 month old who just recently switched to one nap a day. Some days he sleeps for 3.5+ hours, other days he naps for 1.5 hours, all with putting him to sleep at the same time. He has no problem falling asleep, he never wakes up with a messy diaper, the room is good temperature, etc. He doesn't cry when he wakes after 1.5 hours, he just sits there and talks to himself. He acts rested for the most part, but as we get closer to bedtime he gets cranky faster on the days he only sleeps 1.5 hours. On those days I usually put him to bed 30 minutes earlier. I have tried decreasing his wake time in 15 min. increments (so much so that we were back to the previous feeding time, which left no play time). I have also tried increasing wake time in 15 min. increments. Nothing has worked. There are no patterns that I have been able to see to cause the drastic nap lengths. I've even formed his days with the same stimulation side by side and he'll nap inconsistently. One day it will be 1.5 hours, the next 3.5, the next 2.5. It ranges between 1.5-3.5, but mostly is one or the other, not often in between. Am I just out of luck? I don't feel like 1.5 hours is enough sleep for a 14 month old. For more information, he sleeps 12 hours at night. Any help is greatly appreciated. I'm so glad your blog is available for reading up on BW issues & posting ?s; thanks for the time you take to do this! I did BW with my now 5 yr old son beginning at his birth & had great success (this gave me a false confidence in my ability to sleep train). With my now 4 1/2 week old daughter, I'm not experiencing the same success. Since her birth I have worked hard to give her full feedings (25-40 minutes) & immediately put her on a 2 1/2 or 3 hour schedule including the eat/wake/nap routine. However, I noticed she was having trouble going down for a nap despite tired cues. I reread BW & your blog & concluded that she is probably overstimulated as her waketimes were longer than recommended for newborns. So, I immediately cut back and worked to provide less stiumulating wake times. She is a very, very alert baby. At 2 weeks old, she could stare at things for up to an hour. Although that would make it appear that she can handle long wake times, I think it interferred with having good sleep times. At your suggestion, I have been taking notes on everything. I have found that nothing seems to help her sleep well during a nap. She will usually go down quietly, but cry within 5-10 minutes. I let her CIO & she usually falls asleep after some time, but she only "sleeps" for 10-20 minutes before she cries again. If I continue to let her CIO to lengthen her nap, she keeps crying for a stretch & then sleeping for only 5-10 minutes here & there. I've tried letting her CIO the whole time & found she gets little quality sleep. Then by the next cycle, she'll want to fall asleep immediately. If I try to keep her up for even 5 minutes at the next cycle so she can work on putting herself to sleep, she will continue the same ineffective cry/sleep a little pattern as above. This could cycle over & over all day to leave her with little to no quality day sleep. Other times, when I see she only has an hour left in the cycle, I put her in the swing to finish her nap as you suggest. She will be alert for 5-15 minutes in the swing & then fall asleep until I wake her to eat. I'm concerned that her only quality day sleep is triggered by the movement of a swing. I THINK your posts would indicate I should keep using the swing in this way & she should eventually not require the swing as her naptimes on her own will increase– am I inferring correctly???? I think that shows I am giving up on CIO & I feel very discouraged. She can cry for hours and my heart breaks. I've tried checking in (w/ a quick cuddle, patting, shhhing or a paci) and then leaving. The quiet results only last a couple of minutes although she appears to fall asleep instantly. She doesn't need to burp or have her diaper changed. I do usually swaddle her, but she can push out of it & has even moved while crying so much she rotates in her bed. Her night sleep is pretty good. 90% of the time she will go to sleep on her own following night feedings on a 3 hour rotation, even if she is awake when laid down. She just seems to need me or a sleep prop to get proper nap sleep. Is this usual for such a young child? I just need to know if I am interrpreting your suggestions correctly. If so, I will keep on keeping on although it's so hard. I just don't want my baby to cry so much so earlier on in her life. It leaves me feeling like a bad mother; I want to enjoy her while she's so small. BUT, I also want her to learn the skill of soothing herself/falling asleep on her own b/c I know it's good for her in the long run. I'm torn!! Hi! I have an 18month old who has always had nap trouble. I read babywise while pregnant, and found your blog also while pregnant. My question that I have had my whole sons life that I can't seem to get answered anywhere is about the 45min intruder. (darn 45 min intruder!!) Ever since my boy was a little guy he has always woken up at the 45min mark. I kept waiting and waiting every month hoping it would be the month when he would stop waking up early. I got really strict with his schedule and being on time for naps (or early) when he was 11 months old. And it made a huge difference! He slept for 2 hours for both naps. I was a happy mommy! But it only last for 1month. so back to 45 min naps. I gave up on 2 naps at about 13months old, which resulted in him sleeping for about 1hr to 1hr15min for one nap. And then I read happy sleep habits healthy baby, and moved his bedtime up to 6:30. That helped with his wake time, and extended his naps to 1hr15min. Around 16months old I Adjusted his nap to an earlier time and he started long naps again (2hrs-2.5hrs). and that lasted till he was 17.5 months old. SO, now here he is at 18months old and his naps are 45min-1hr long. Most of the time, it is 1hr from the time I lay him down. He goes down very easily, we have a really great bedtime/naptime routine. But he wakes up screaming at 45min. He has only woken up happy from a nap a couple of times in his life. Same with waking up in the morning, wakes up crying! Here is his current schedule, PLEASE give me some sort of advice! This mama is needing some positive direction!!! He has also been an early riser (6-6:30) when his naps are short. When he gets a good long nap in, he sleep in till 7:00.Wake: 6:30 (sometimes 6)Lunch: 10:30Nap: 11:30wake: 12:30sleep: 6:30As far as CIO, he has never fallen back asleep. I have let him cry for up to 2hrs. with no success. Hello.. My daughter will be 10 weeKs on thanksgiving. I'm still figuring out her wake times sometimes great naps sometimes awful. Sometimes wake time is 30 min.. Seems so short for her age? Do babies ever nap bad when they haven't had enough wake time? I don't see really any cues for when she's ready for a nap so it's been hard to get an ideal time and therefore an inconsistent nap. Any suggestions would be great! Also we still are in witching hour mode when does it usually end? Seems shell only really sleep that nap bring held or in a sling etc. We have been following bw since brith with our 5 week old now, one thing that she continues to seem to do is fight sleep. We have tried shorter wake times and longer ones and nothing seems to work, we notice her sleep cues and put her down… Any advice on babies that "fight naps"
Ok I would really appreciate your help with my first born. I am new at this whole mother thing and at first it was easy my daughter was waking up every 3 hours to eat then went right back to sleep from when she was born to about 3 months then she only woke up twice a night to eat. She just turned 4 months old and her sleeping is all out of whack! I started her on cereal and I think that is what might have done it I'm not sure. First she only takes about an hour long nap about 3 or 4 times a day and during the night when I first put her down for the night she will sleep about 4 or 5 hours straight then wake up either squirming for her pacifier or will want to play and stay up until I feed her then she will go back to sleep for about 3 more hours. If she just wants pacifier she will fall back asleep and wake up every hour for it which causes me to get no sleep. She does sleep in her crib in my room and during naps she usually laid in the swing. She will stay up about 2 hours before she starts rubbing her eyes showing signs of tiredness then I lay her in the swing and she falls asleep on her own after putting pacifier back in mouth several times. At night I swaddle her or else she will fling her arms everywhere waking her up but she still seems to break loose. At this point she should almost be sleeping through the night or taking at least 2 hour naps so what should I do to help make that happen. How long should wake time be for a 4 month old? My four month old son is having trouble now with his naps. He used to be a baby who never cried… and I am finding that lately he cries quite often. Now, when I put him down for a nap (and i am realizing it might be a little too late), he is rubbing his eyes, but then starts smiling and kicking and acting kind of hyper. Then if I leave the room, he starts crying and will not fall asleep. I used to be able to put him in the crib fully awake and he would roll over and fall asleep. Now I find that i need to use the pacifier, shush, pat and all sorts of other techniques to get him to sleep. Did I do some sort of accidental parenting that made him need me / pacifier to fall asleep? And how do I undo this. I am hoping I can get back to the place we were when he realized that his crib meant sleeping 🙂 Any tips? Part of it could be that he needs more time to adjust to the new routine and schedule. It isn't uncommon to have short naps at first. Reflux also usually means shorter naps. I would suggest you read my post "waking early from naps/won't fall asleep for naps." My second had reflux, and when she woke early, I put her in her swing to finish the nap. She easily moved to sleeping longer once the reflux stopped bothering her and hasn't ever had bad habits from it. Hi! First off, thanks for this great blog- it's such a wonderful resource! I've got a question about my 7 week old son's naps. I always have him down for naps by the one hour of wake time mark, but he is still taking 45min-1hr naps a lot of the time. This results in only a 2-hr schedule at times, which I know is shorter than he is capable of, because other times he will sleep for 2 hours (or more if I'd let him! ), and is totally fine with it. It doesn't seem to be a food issue, as the times that he's woken early and I don't feed him right away for one reason or another (I have a 2yr old to deal with too) he doesn't seem bothered by the fact that he doesn't eat immediately. Also, when my 2yr old takes her nap (1-2:30ish), I'm careful not to let the baby cry when he wakes so that he doesn't wake my daughter in the next room, so I go get him up as soon as he wakes early and I sit in his rocker and he immediately falls back asleep for another 45 min-1hr or more in my arms. This is the only time of day when this is an option, so I don't know what to do for the other naps that I can't sit as rock him for the rest of his nap. Will he just outgrow these short naps or is it something I'm doing wrong? His wake times seem about right, he's sleeping decent at night (10:15pm-4:30am, eat, 5-7am), so I'm not really sure why to do. A second (off subject) question is about bedtime and witching hour. We have nights where the baby doesn't do much sleeping between the hours of 5-10pm, and I can't seem to fix that. It results in the baby only getting a total of maybe 14 hours of sleep in 24 hours, which seems low at this young age. Any tricks for getting him to sleep during those hours? He especially won't sleep in bed at that time, and if he does sleep at all it's usually in the swing. As a result, his actual bedtime is 10:15pm after his last feed, which means his total night sleep is only about 8 hours. This also seems low for this age, no? !Thanks in advance for your help! I would spend some time analyzing the difference between when he sleeps a short nap and when he sleeps a long nap. I would take notes and find out if there is a pattern. Is it the same nap each day that is short? What is done during waketime before the long vs short naps? What is the nap routine like? Etc. since he has some long naps, that is I would do. Do you have a swing you could put him in for other naps when he wakes early? I have a post on witching hour that can help you. Some people find luck with putting the baby down for a nap before the witching hour time starts. If it is witching hour, it is totally fine to have naps in the swing during that time. Hi!My son will be exactly 5 months in 5 days. We started babywise scheduling late. We started at around 3.5 months old. So he's been on the 3 hr feed schedule. I feed at 7a and so on. Also I still do a dream feed. He's been napping great until this past week. Lately he's been waking up an hour early from his nap. Whining/crying. I though it might have been a hunger issues so I fed 20-30 mins earlier than usual. But he's actually eating LESS. He was able to drink 4 oz or more during a feed and now he only wants 3 oz max. I'm so confused on what to do. He still sleeps through the night but now waking up at 6am. Instead of 6;45-7am. Im afraid to take away the dream feed for fear of him not getting the nutrition/calories he needs to sttn. Also he has reflux but is on the highest dose for it currently. I always make sure he is well burped etc. what do you think the issues could be? Should I be doing something differently? What is his reflux med? If it is Zantac, he might need another kind. It could be teething pain It could be that he needs the dreamfeed dropped–he might eat more at other times with fewer feeds. The dreamfeed can also start to disrupt night sleep. This happened with my 4th child. I would rule out pain/sickness first since you have ruled out hunger. Then I would experiment with dreamfeed. Thanks for responding! !He's on Prevacid.. And on the highest dosage for his weight. But I have noticed he's been spitting up more than usual. I'm an exclusively pumping mom and use dr browns bottles. Also took dairy out of my diet. Bc that's the only thing that seemed to make his reflux bad. Do you think that maybe I should be changing his feeding schedule now that he's getting older? How do I know if he's ready for a 3.5 hr schedule instead of his now 3 hr?Also I have a guy feeling it might be his wake times that's contributing to his poor napping lately (and his reflux). He usually can stay awake 50-1 hr. but do you think I should try to see if he can extend to maybe 70 mins instead? When I put him down 50-60 mins of wake time he usually falls asleep withing 10-15 mins. Usually in that 10-15 mins he's rolling all over trying to get comfortable and sucking his thumb. His reflux is probably contributing to his fussiness.. He may have gaine more weight now. We have a drs appt in 2 days so ill talk to his doctor about it then. Can't do much about it til then but try to not aggravate it…I'm just at a loss.. I don't feel teeth coming in. He actually hasn't even starting putting toys in his mouth yet..
Valerie, I can't express how much of a blessing you have been to me as a first time mom! This question has been asked over and over but I haven't found anything that works for us.My 3 1/2 month old son has never slept longer than 45 minutes. Ever! I've tried everything! We are still on a 3 hour schedule but it's always so messed up by the afternoon because he can't stay awake longer than 1 hour 15 minutes. Everyday we quickly fall into an eat/sleep/wake routine. When he wakes up is my only option to leave him in the crib to cry if I want to stick to the 3 hour schedule? I read that you kept Brayden on 2.5 hours for awhile. Is that something you recommend for te chronic napper? Yes, staying on short cycle can help with the short mappers. The trick is to try to figure out the reason for the short napping. Is it hunger? Pain? Discomfort? Noise? Light? Waketime length? The only way to know how to respond is to figure out the reason. Have you read my troubleshooting naps tips? I did read your troubleshooting tips. We finally committed to just crying it out with no checking on him and within days we had full naps! It was the first time since he was born that I didn't feel depleted. Just a week later he has learned to turn over and I think he is teething so things are bad again. We are managing the pain and lack of sleep. I am doing my best to think before I act and trying to stay positive that our work we did will not be undone but it has been hard to make progress and then go backwards. I really miss the predictability. Is this what I can expect? Tackle one sleep hurdle and run into another? Does it ever get better for good?? Sorry–you will feel like things change constantly. I have a post called "just when you get it, everything changes" that will commiserate with you. What do you do if they get overstimulated and are crying while trying to nap? My 13 week old has recently started crying when going down for at least one nap a day and I eventually have to go in and hold her paci until she goes to sleep. Once she is asleep she is fine but what should I be doing if I think she has been overstimulated? At the nap, it is wise to help however you can. Take note of it and figure out why she was overstimulated and prevent it in the future. My baby girl is 9 months old and she seems to stay awake way longer than the 2 hour wake time. Most days she is awake 3 hours and only naps 1 hour. She use to be such a good napper and now I am lucky if she does an 1 hour a nap. This is her current schedule. Any advice would be much appreciated! I have a blog myself and would love to mention how yours has helped me. 645/7am -wake -nurse at 730 (meds right when she wakes and have to wake 30 mins)10/1030-nap11/1130-wake nurse 3/330 nap 4/430-wake-nurse745-down for night and STTNShe also eats solids and eats pretty well. Rebecca, have you tried just putting down at 2 hours instead if waiting until 3 hours? At that age, I do a "2 up , 2 down" policy. The child is up two hours, naps twoHours. Hi There! I love your blog and really appreciate all of the tips from yourself and the other moms! We started Babywise with our Son now 12 weeks old when he was 8 weeks old. He has been having a problem with short naps ever since he was 7 weeks old. On the dot he wakes up at the 30 minute mark. I've read all of your waking early, wake time, easy nap fix posts. I know he can't be hungry because he will eat but only for a few minutes. I can literally watch him on the monitor and see him wake at 30 minutes. But, at night he sleeps right through this transition at 30 minutes, no problem. We've tried CIO,Rocking him back to sleep and nothing works. I've relented to the pick him up and hold him to let him finish our his naps as he's very tired still and falls asleep quickly in my arms after waking. I should also mention we put him in the crib sleepy but awake every time so I know he has the ability to fall asleep by himself he just won't do it during the day. I'm getting very frustrated and am back to work this week so I really need him to take better naps! Any advice you or anyone would have would be much appreciated. Thank you! I want to thank you a MILLION times over!! I have 2 little ones and have read the Baby Wise books and your blogs constantly for help/guidance with both of them. My youngest is 8 weeks old and has been throwing me for a loop. About 2 weeks ago he started waking up 30-45 minutes into EVERY nap. I hadn't done CIO yet because of vacations, etc. so I assumed that he didn't have the skill to settle himself at the sleep transition. Within 4 days he was putting himself to sleep in 5-10 minutes with little to no fussing, but he was still waking up screaming 30-45 minutes after he fell asleep. We were both exhausted! I had read this article before, but dismissed it because I thought I had his wake time figured out and was starting the nap time routine at 45 minutes. So today I thought, what the heck, let's give it a whirl. I set the timer on my phone for 40 minutes and immediately started the routine with him. He is currently taking his FOURTH nap that has been at least an hour and a half!!!! I definitely think it was a combination of both and I never could have done it without your blog. Thank you SO MUCH for giving this Momma back her sanity and helping this sweet boy get some sleep!!! Where would my family be without you?!?! Hi! Our third princess is 3 months old and we have loved using Babywise with all of our girls! Addy had been on a 3 hour schedule since she was born. She has consistently taken 45 min naps. I have first treated it as a feeding issue and am now pretty confident that's not the problem. I just recently started looking into the optimal awake time as the culprit but I'm running into an issue. With her on a 3 hour schedule she will eat at 7am but awake till about 8am and then only sleep for 45 mins. I leave her in her crib so I don't interfere too soon and after about 10-15 mins she is still awake and it's now 9am. She's not due to eat until 10am. She's happy so we play and watch our silly older sisters play. I fed her at 10am and she stays up till 11am… But now she's been awake from 8:45 to 11am… Over two hours! Sooo long! What's my step here?? I want to be sure I am following the eat. play. sleep cycle but I know she's awake wayyyyy too long. Help? Hi! I was curious if you have any advice for my 6week old. We have been using babywise from day 1, and we were on a great 3 hour schedule with nighttime sleep extending into the 5-6 hour range. Recently, we had a hiccup with some severe stomach pain for our little one. He's on formula now instead of breastmilk (not by choice but necessity) and we have gone through several kinds trying to find the right fit. This has resulted in horrible pain and tons of gas. During that time, the schedule was completely thrown off. Now that we have what seems like a good formula match, and his gas is much more manageable, I'm anxious to get back to normal. He has adjusted back to his daytine routine pretty well….he's waking from naps early, so I'm going to try your suggestion of shortening his wake time. I think he will adjust fine there, but the night time is a different story. Before, he would have his late feeding at 10:30,sleep until about 3 (or longer) and then wake for his morning at 7. The whole schedule looked like this…(each waketime is about 1-1/2 hours including feeding)7:00am10:00am1:00pm4:00pm7:00pm10:30pm3:00amishNow, post stomach issues, he is waking up at 1:00am almost every night like clockwork. He obviously is not hungry, and just seems to be waking to "play". I've let him CIO several times, but he outlasts me (over an hour) and his cry is different (he wails, which is not like him). When I pick him up, he immediately stops and is content…will fall asleep in my arms. When I put him back down, he'll wake up in about 10mins. To deal with this, I've just started doing a 1:00, 4:00, 7:00 feeding cycle at night in hopes he will stretch it out again. My concern is that I don't really think he's hungry at 1:00 even though he takes a bottle, and I know he can make it longer. This is the night schedule from our week 2, and I feel like we have lost all our progress. Any ideas? Hi Valarie, Thank you for this blog it has been so helpful in applying BW! I have a 4 week old and from just 1 week old he started showing very obvious signs that he hated being put down for a nap (how can they be so aware at that age?!). From day one he has been a very alert and happy baby, the doctors and nurses were all amazed at this, he has been smiling, tracking faces, ‘talking’ to us and holding his head up from two weeks old and is generally very awake and alert, some have attributed this to him being full term and natural delivery at 4.2kg, he was a big healthy boy. However, every time I either take him into his room, or start to swaddle him he goes from very happy and content to pretty much screaming and thrashing about. I’ve tried all your suggestions on creating the right environment, winding him down, watching wake-time (increasing and decreasing) and have had no luck. I have to either vigorously rock him and pat his bum to get him to calm down and become drowsy or walk around the house with him so that he’s not in his sleeping space until he’s sleepy and then try put him down. Sometimes he will nod off on his own if I place him down not fully asleep but usually once placed in his bed he wakes up and screams straight away, I can’t console him with patting or shhhhing so have to pick him up and start again! I’m terrified of creating a sleep prop but this can often go on for the whole sleep-time and then i’m not sure if the sleep prop or the not sleeping is worse! I’m not too keen to do CIO so young, or at all! I’d so appreciate it if you have any advice? I’m driving myself nuts researching what to do and missing out on enjoying my little boy because I’m so stressed about creating bad habits and wondering why he doesn’t want to go to sleep!